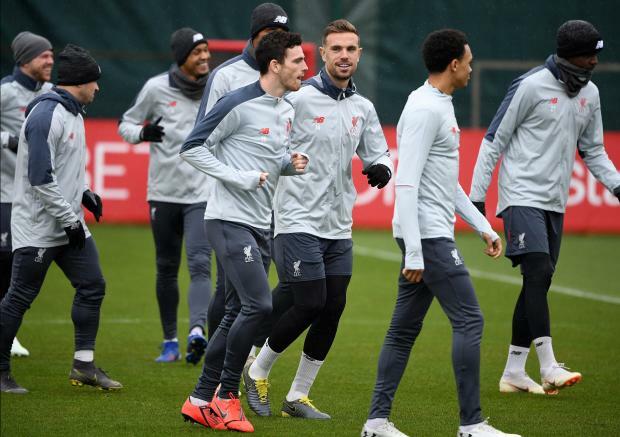 Liverpool's Scottish defender Andrew Robertson (centre) and Liverpool's English midfielder Jordan Henderson takes part in a team training session. But the 28-year-old has won Klopp's trust so completely that he goes into Wednesday's Champions League quarter-final second leg at Porto firmly established as one of the key components of Liverpool's push for a European Cup and Premier League double. "We looked at Jordan Henderson a lot, and Steve Bruce was unfailingly enthusiastic about him. But we noticed that Henderson runs from his knees, with a straight back," Ferguson said. "The modern footballer runs from his hips, and we thought this gait might cause him problems later in his career." Impressing Klopp with his tactical discipline and relentless work ethic, Henderson has improved significantly since the German took charge at Anfield in 2015, earning the captain's armband. But even with his place in Klopp's plans secure as a reliable defensive midfielder, Henderson remained restless for a bigger role in the team's attacking scheme. Offered the chance to play in an advanced midfield berth during England's recent Euro 2020 qualifiers against the Czech Republic and Montenegro, Henderson showcased his versatility with two terrific performances. Emboldened by those displays, Henderson made a beeline for Klopp's office on his return to Liverpool's Melwood training ground and made his case to be used in the same role with the Reds. It wasn't the first time this season Henderson had been willing to challenge Klopp after the pair briefly clashed on the Old Trafford touchline when the midfielder was substituted against Manchester United. Intriguingly, Klopp decided to bow to Henderson's request on this occasion and the results have been a revelation. He scored his first goal for 17 months in Liverpool's 3-1 win at Southampton, delivered a dynamic show in the 2-0 Champions League first-leg victory over Porto and then set up Sadio Mane's opener in Sunday's vital 2-0 success against Chelsea. "From now on, all the time when players come into my office and ask for a different position, I will play them. It's brilliant!" Klopp joked. "Actually we had that talk. He played the other positions when we had a need and played them really well. "Now you can see he is really energetic. For the game against Porto, wow. So no problem. That is my job, to play the players in their strongest position. "In the last three games he's obviously on fire." Henderson's Liverpool team-mate Mohamed Salah believes the switch to a more attacking position has benefitted the rest of the side as well. "Hendo did a great job and it makes it easier for me. I think we do a good job together, we know how to play to each other," Salah said. They are also within touching distance of the Champions League semi-finals and Graeme Souness, himself a buccaneering midfielder in Liverpool's golden era, gives plenty of the credit to Henderson. "He's got great energy. Now he's off the leash and he'll be better for it,' Souness said. "It's definitely his best position. Jordan wants to be on the ball and he's got that athleticism."